The first day of the 2012 horse racing season was all about the first “derby” of the year – a new race called the Gulfstream Park Derby. Though it wasn’t a graded stake, and the purse was only $100,000 a field of 11 colts showed up to start their path on the Kentucky Derby trail. As most of the horses in Sunday’s race were either making their stakes debut or taking a step up in class it was no surprise that handicappers didn’t quite have this one figured out. Ancient Rome, the lukewarm 3-1 favorite didn’t do anyone any favors by finishing second to last after racing three wide, getting tired, and calling it quits after the first half mile. The winner of the Gulfstream Park Derby ended up being the Calder shipper from across town, Reveron who connected for a nice $19.00 win mutual. While most players on Sunday left Reveron off their tickets, Winning Ponies had this one nailed with Reveron as the #1 selection for this race. The other two co-favorites Casual Trick and King Kid ran in the place and show spot respectively – meaning fans who keyed Reveron on top those two in the trifecta received a generous payout of $447.80. Reveron accomplished his first stakes win by tracking 30-1 shot Nachas and Joy until the far turn – then responded well to a challenge by Casual Trick and held him off though the stretch to win by a half-length. The final running time was a moderate 1:44.72 with respectable opening fractions of :23.45 and :47.42. The winning Beyer Speed Figure of Reveron came back as an 87 – a very nice number for a horse coming out of an allowance race at Calder. The trainer of Reveron, Agustin Bezara, is a newcomer to the US racing scene after leaving his native Venezuela just two years ago. After his win in the Gulfstream Park Derby Bezara was ecstatic proclaiming that he thinks Reveron is the best 3-year-old in training in Florida. Whatever Bezara has been doing with his horses it certainly paid off this weekend as he had two other winners on the card. Not bad for a guy with a stable of only five horses. While it is certainly too early in the season to tell if Reveron will make an impact in stakes that attract tougher competition, he’ll be fun to watch. The next stop on the Kentucky Derby trail at Gulfstream is the Grade 3 Holly Bull Stakes to be run on January 29. While the connections of Reveron, haven’t yet committed to anything yet – many are predicting to see him start in the Holy Bull, health permitting. Bezara has already noted that Reveron seems to enjoy going two-turns and the Holy Bull is the prefect place to prove he’s for real. 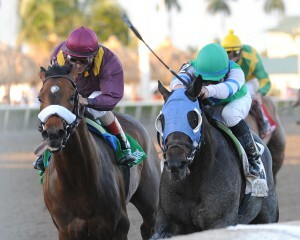 Nominations for the Holy Bull close on January 14, 2012 so be sure to check back here at Winning Ponies for our opinion on one of the more prominent Kentucky Derby prep races of the season in South Florida.